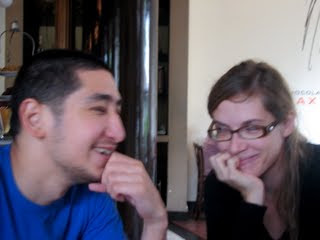 Filipino-Canadian film critic Alexis Tioseco, 29, and his girlfriend, Nika Bohinc, a Slovenian film journalist, were killed by robbers who broke into their Quezon City home past 10 p.m. of September 1, 2009 (Tuesday). Reports said that Tioseco and Bohinc were shot several times by three unidentified men who robbed the victim's home at 39 Times St., Brgy. West Triangle. It was their new helper, Criselda Dayag who let those three men to break in and burgle. I don't know Alexis personally, but I remembered him because he was just behind me at the line waiting and hoping to enter the theater at the Shangri-La Mall to watch Independencia (a film by Raya Martin) on June 12, 2009, the day we celebrated Philippine Independence. There was a clamor then of people who couldn't enter the theater because it was full and a lot of film enthusiasts had waited for several hours already without prior notice. I talked to Alexis a bit but not on a personal level. After the long wait, we were accommodated to watch the Cannes shortlisted film for the second batch of screening at 8:30 pm. We have lost a gem in Film Criticism. Alexis can do so much for Philippine films. I wish both of them are still here nurturing our appreciation for cinema and deepening our understanding of the films that we watch. For any information that can track down the suspects, the police can be contacted through telephone number (632) 922-5177. Using the couple’s Ford Lynx (plate #: CPW-329), the suspects fled the scene with Criselda. They also took an undetermined amount of cash, jewelry, and a laptop. Updated on August 14, 2011: I stumbled upon an article, "The Man Who Killed Alexis Tioseco," (dated August 28, 2010) from Inquirer.net. This article is quite confusing and has so many typo errors that gave me a headache! There could be some missing paragraphs or lines. Hope they check on it and revise.